Spokane Valley ENT offers comprehensive hearing aid fitting, maintenance and repair services. Whether you are new to hearing aids, or you have been wearing hearing aids for years, Spokane Valley ENT offers comprehensive hearing aid fitting, maintenance and repair services to help you overcome your impairment and achieve the best hearing possible. 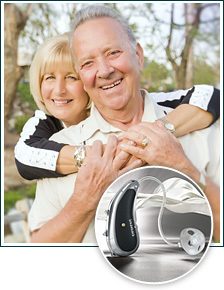 Our certified and licensed audiologists have extensive experience fitting and dispensing hearing aids of all types. We are constantly exploring and evaluating the latest hearing-aid technologies and offer a variety of products, brands and styles to fit every hearing impairment, lifestyle and budget. In addition to hearing aids, we also offer assistive devices, such as amplified telephones, alarm/alert devices, and personal listening systems for televisions. Our location within Spokane Valley ENT gives our patients easy access to physicians for consultations and input on related problems such as ear wax, ear infections, and progressive hearing loss, tinnitus or vertigo. At Spokane Valley ENT, our commitment to service means we will help you be successful with your hearing aids as long as you own them! We believe strongly in providing only the highest quality of care. You will work with only certified, licensed audiologists, and board certified physicians, so you receive the most comprehensive hearing care available. We offer lifetime service on every new hearing aid we fit. Most new hearing aids include a 3 year warranty, 3 years of batteries and a 60 day trial. Meet Spokane Valley ENT's audiologists. © Spokane Valley Ear, Nose, Throat and Facial Plastics, P.S.